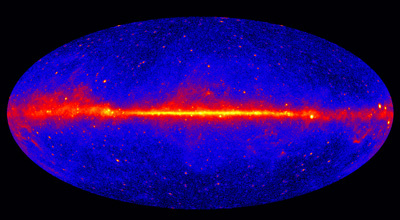 Since its launch in June 2008, the Fermi Gamma-ray Space Telescope has opened a new window on the high-energy universe, giving astrophysicists an unprecedented ability to study the exotic cosmic phenomena that emit gamma rays, the most energetic form of radiation. As project scientist, Steve Ritz was responsible for the overall scientific success of the Fermi mission, overseeing a complex collaborative effort that involved physicists and astrophysicists, two federal agencies (NASA and the Department of Energy), private contractors, and academic institutions and partners in France, Germany, Japan, Italy, Sweden, and the United States. "There were a lot of different components, and it was a multicultural, international project. My job was to make sure it all worked together scientifically," said Ritz, now a professor of physics at UC Santa Cruz and director of the Santa Cruz Institute for Particle Physics (SCIPP). Ritz began working on the project in 1996, when it was known as GLAST (for Gamma-ray Large Area Space Telescope). He served as deputy project scientist from 2000 to 2003 and as project scientist from 2003 to 2009, based at NASA's Goddard Space Flight Center. He has also been the deputy principal investigator for the mission's main instrument, the Large Area Telescope (LAT), since 2004, only stepping down from that position earlier this year when he took on new duties as camera project scientist for the Large Synoptic Survey Telescope (LSST). A team of UCSC physicists at SCIPP played a leading role in the development of Fermi's LAT. Adjunct professor of physics William Atwood came up with the LAT's overall design concept, and an international team led by SCIPP physicist Robert Johnson developed the LAT's tracker and electronics. UCSC physicists and astrophysicists have also been involved in many of the scientific discoveries based on data from the Fermi mission. Johnson, who has known Ritz since they were both graduate students, praised his leadership and ability to coordinate the efforts of many different groups. "He's great at leading people in a big collaboration, always able to mediate conflicts in a very amiable way," Johnson said. "He also contributed technically in many ways toward bringing the whole thing together. Technically Fermi has been very problem-free, and scientifically it has also been a tremendous success." After five years in orbit, the Fermi spacecraft and its two main instruments, the LAT and the Gamma-ray Burst Monitor (GBM), are in excellent working order and continue to deliver exciting new data, observing 24 hours a day, seven days a week. The LAT scans the entire sky every three hours, detecting a wide range of gamma-ray sources. The GBM, meanwhile, has become the premier detector of gamma-ray bursts. Fermi has contributed to diverse areas of research, from pulsars and stellar explosions to supermassive black holes and the search for dark matter. The mission found direct evidence for supernova remnants as the source of high-energy cosmic rays, confirming that subatomic particles are accelerated to nearly the speed of light by the expanding debris of a stellar explosion. Fermi has also been used to study terrestrial gamma-ray flashes associated with lightning storms on Earth, as well as gamma rays emitted by solar flares. Active galactic nuclei (AGN), powered by the accretion of matter onto the supermassive black hole at the core of a galaxy, have been a productive area of research for Fermi. The mission has discovered many new blazars (the brightest AGNs) and yielded new insights into the processes and mechanisms involved in AGN emissions. One of the mission's most striking results was the discovery of two giant gamma-ray bubbles extending more than 25,000 light-years above and below the plane of our galaxy. Scientists think these structures may have formed as a result of past outbursts from the supermassive black hole at the heart of our galaxy. Additional studies of the galactic center are planned for the LAT. The galactic center is expected to be one of the best places to search for gamma-ray signals from the annihilation of dark matter, an elusive substance that neither emits nor absorbs light. According to some theories, dark matter consists of exotic particles that can collide and annihilate themselves, producing a flash of gamma rays. Fermi's non-detection of such a signal to date provides limits on the nature of the particles. Ritz, who has now stepped down from all formal roles in the Fermi mission, is still very much involved in the mission. 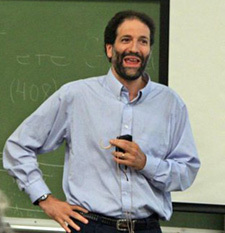 Along with his SCIPP colleagues, he is advising UCSC students and postdoctoral researchers who are collaborating on data analysis, particularly in searches for signals of new physics and new phenomena. "Now I just enjoy the science from Fermi, which has provided a huge leap in capabilities for gamma-ray science," he said. "For me, it was just incredibly enjoyable to work on this project. Working with great people and doing great science--it doesn't get any better than that." For more information about the Fermi mission, see text, images, and video on the NASA web site.